Ravioli filled with scallions, served with yogurt, mint and garlic, topped with ground beef. Specially fried in low cholesterol oil, twin bowling pastries are filled with seasoned potatoes, garlic, and cilantro. Served with raita. Pan-fried eggplant seasoned, then baked with fresh tomatoes, and green bell pepper. Served with yogurt garlic mint sauce. Pan-fried then baked baby pumpkin, seasoned with sugar, served with yogurt and topped with ground beef sauce. Spinach with sauteed onions, garlic, salt and black pepper. Potato curry made with special spices. Served with homemade sauce. Six pieces. Fried pastry filled with potatoes, green peas, and spices. Served with homemade sauce. Six pieces. Baked pastries with beef. Five pieces. Deep-fried balls made from ground chickpeas. Classic Mediterranean eggplant dip. Baked eggplant pureed with tahini, garlic, and olive oil. Served with tandoori nan. Marinated boneless chunks of chicken. Served with salad, rice, bread, and chutni. Marinated boneless chunks of grass-fed lamb. Served with salad, rice, bread, and chutni. Marinated chunks of beef. Served with salad, rice, bread, and chutni. Two skewers seasoned ground beef. Served with salad, rice, bread, and chutni. Two pieces of marinated salmon. Served with salad, rice, bread, and chutni. Three pieces of marinated baby grass fed lamb chops. Served with salad, rice, bread, and chutni. Jumbo shrimp marinated in a blend of Afghan spices cooked on skewers in the tandoor. Served with salad, rice, bread, and chutni. 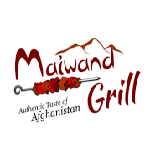 Beef seasoned in Afghan spices. Served with salad, rice, bread, and chutni. Tender pieces of chicken marinated in sour cream butter sauce, with ginger, garlic, and fresh coriander leaves. Served with salad, rice, bread, and chutni. Two pieces of pan fried ground beef marinated in fresh grated spices. Served with salad, rice, bread, and chutni. Seasoned ground chicken mixed with cheese and mix spices. Served with salad, rice, bread, and chutni. Served with salad, rice, bread, and chutni. Beef seasoned in our specialty house spices. Served with French fries, salad, rice, bread, and chutni. Chicken seasoned in house spices. Served with French fries, salad, rice, bread, and chutni. Vegan falafel balls served with hummus, Afghan salad, kabuli rice, and tandoori Naan. Boneless leg and thigh marinated in chilly paste, garlic, ginger, fresh lemon, and coriander powder. Served with salad, rice, bread, and chutni. Marinated tender chicken cubes. Served on house salad with homemade balsamic vinaigrette dressing. Served with salad, rice, bread, and chutni. Dark meat chicken on the bone marinated in tandoori seasoning. Served with salad, rice, bread, and chutni. Set of chicken tenders served with french fries. All natural real fruit smoothie. Layers of thin pasty with walnuts, almonds, and pistachios with honey caramel. Rice pudding with pistachios and cardamom.